Black and Decker Air Fryer products have always been known for their quality, especially when household kitchen appliances are created. 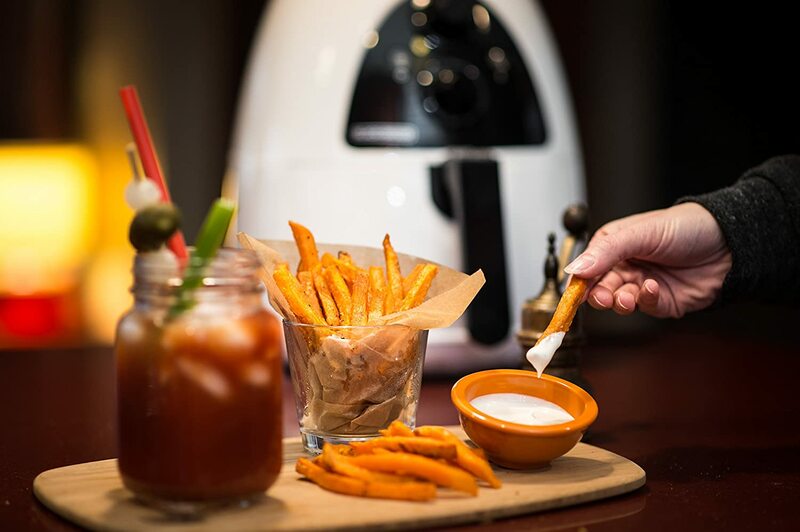 The Black & Decker HF100WD Purify 2-Liter Air Fryer has everything you need to give you what you crave without having added fats, greases, or pounds. What really sets the black and Decker product apart is that it has twin convection fans cooking the food rather than just one, meaning that your food cooks evenly, gets fast quickly, and gets just as crispy as you want. While most models can only consistently reach temperatures of around 350 degrees Fahrenheit, the Black and Decker model goes above and beyond to reach 400 degrees without even breaking a sweat, overheating, or struggling to operate. Like other models, safety ensures that this product shuts itself off after sixty minutes of operation, but that should be plenty of time to finish whatever food you might be cooking. If you’re looking for great features, look no further, because the Black and Decker delivers just about everything you could ever want in a fryer with absolutely no guilt, and all of the flavor. 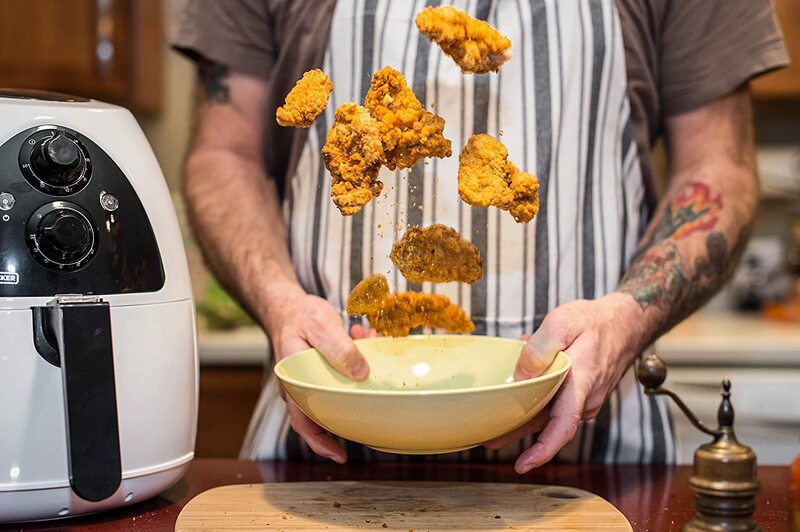 Control your food like never before in this 2 liter cooking device that’s perfect for families, friends, and even neighbors. You never have to worry about burning your hands either, because the Black and Decker HF100 model was built with you in mind. You’re bound to love this product for a wide variety of reasons. First and foremost, because you can enjoy all of your favorite foods again, without the guilt and without the fat. The variable control guarantees accuracy, meaning that you food should be perfectly cooked every single time you cook. Plenty of room inside the fryer, meaning that you’ll be able to fry up to eight chicken wings at a time, or two large russet potatoes. While the Black and Decker model has a slightly higher price than other similar models, it delivers the absolute best frying experience on the market, hands down. No matter what you’re trying to cook, how it turns out, or what your family experiences, you know you’ll consistently be getting the best results in half the time of other models, guaranteeing that you’re happy with your fryer. Cook virtually anything you want with practically no mess and no fuss- only air. You’ll love the results that these types of fryers bring you because they’ll completely revolutionize your life and the ways that you eat food. Never again will you struggle to choose from your favorite foods because they’re fatty or unhealthy. Love your vegetables- fry them with air! Instead of struggling with soggy slimy steamed vegetables, join the revolution that’s sweeping the nation and try the Black and Decker Air Fryer model today. Perfect for cooking anything you can imagine, with twin convection fans delivering even, consistent heat. Works great with large families, because it cooks fast, cooks perfectly, and delivers consistent results. No sticking, no mess, and no extra grease, so you can cook a snack, cook a meal, even fry your dessert in a snap. Never struggle to get your favorite flavors while feeling bad about your choices. You really have to practice to get excellent consistent results. You can’t expect to just throw food in the fryer and get perfect results, but after working with the product, circulating your food, and really getting the hang of it, it’s easier than other methods of cooking. Not really “fried” food, more of a very powerful table-top oven, but the results speak for themselves, flash baking food, making it crispy and delicious. 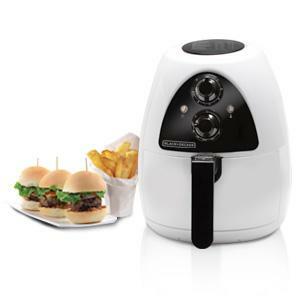 You’ll love the way that this model of Black and Decker Air Fryer cooks your food, with no mess and no hassle. You never have to worry about the results, because this model consistently delivers the best. It might not be a specific fryer, but you really don’t NEED an actual fryer to get amazing results. It’s well built, intuitive, and powerful to deliver the results that you need to cut the fat and kick the grease and oils for good. Never struggle with your weight again.